Wang had an outstanding month of April at the plate, hitting for a .567 batting average with seven home runs and 25 RBIs. Chris Franklin | The Sun: Olivia Wang runs to second base during Lenape’s game against Shawnee High School on Monday. 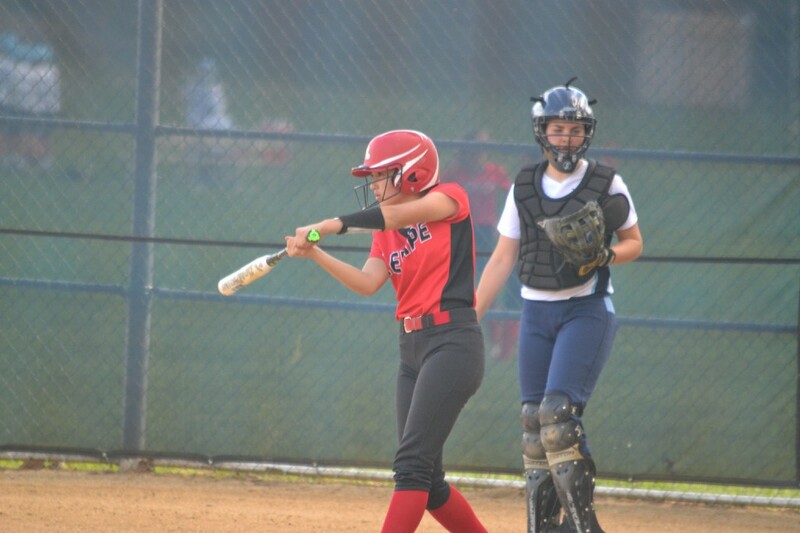 It’d be hard to find a high school softball player with better hitting numbers in April than Lenape High School junior Olivia Wang. During Lenape’s 10 games in April, Wang tore the cover off the softball. She recorded 17 hits in 30 at-bats, smashed seven home runs and led her team with 25 runs batted in. Wang’s on-base percentage plus slugging percentage totaled nearly 2.000 in the season’s opening month. Wang doesn’t have the look of a power hitter. She doesn’t feature a ton of upper body strength. However, she understands the art of hitting and breaks down what she’s going to do in each at-bat before she steps into the batter’s box. When she’s at the plate, Wang focuses on making solid contact. Wang’s hitting ability can be traced back to her childhood. At the age of 3, she recalls how her dad taught her the basics of hitting. Chris Franklin | The Sun: Olivia Wang prepares for her first at-bat against Shawnee High School on May 1. Softball has been one of Wang’s passions ever since she was young. She has played on numerous travel teams and currently plays for both the South Jersey Rebels and South Jersey Mystics in addition to playing at Lenape. Lenape head coach Eric Krastek marvels at Wang’s athleticism. He describes her swing as fluid and effortless, and feels her vast playing experience has allowed her to acquire an outstanding knowledge about the sport. Wang’s athleticism extends to defense, where she possesses the ability to play a number of positions. Wang has played most of 2017 at catcher, but she can also play in the outfield and at shortstop. While the specifics of playing each position are different, Wang feels the thought process of being on defense is the same all around the field. “You need to think about what is the ball going to do when it gets to me,” Wang said. Wang is a team player who is open to trying new positions and playing wherever the coaching staff asks her to. Krastek said Wang is a solid team player at the plate as well. Wang’s recent outburst has rubbed off a bit on her teammates. 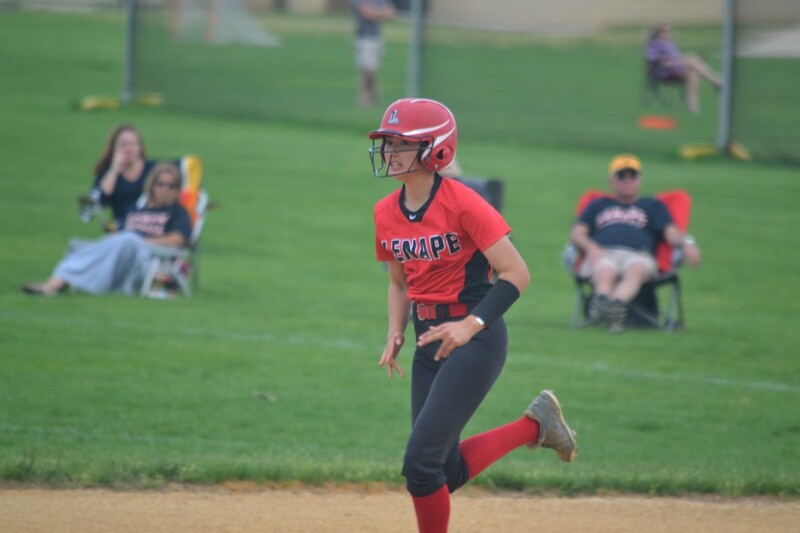 Lenape scored seven runs against former all-Olympic Conference first team pitcher Rachel Waro in a win over Eastern Regional High School. The Indians also scored more than 20 runs twice in a span of four days against Cherry Hill High School East. Krastek feels with some more consistency, Lenape could be a force in the final weeks of the season. “We have a lot of girls like Olivia who didn’t get a whole lot of varsity experience last year, so I am starting to feel it’s starting to click for us,” he said.